Larry McMurtry has done more than any other living writer to shape our literary imagination of the American West. With The Last Kind Words Saloon he returns again to the vivid and unsparing portrait of the nineteenth-century and cowboy lifestyle made so memorable in his classic Lonesome Dove. Evoking the greatest characters and legends of the Old Wild West, here McMurtry tells the story of the closing of the American frontier through the travails of two of its most immortal figures: Wyatt Earp and Doc Holliday. Opening in the settlement of Long Grass, Texas—not quite in Kansas, and nearly New Mexico—we encounter the taciturn Wyatt, whiling away his time in between bottles, and the dentist-turned-gunslinger Doc, more adept at poker than extracting teeth. Now hailed as heroes for their days of subduing drunks in Abilene and Dodge—more often with a mean look than a pistol—Wyatt and Doc are living out the last days of a way of life that is passing into history, two men never more aware of the growing distance between their lives and their legends. Along with Wyatt's wife, Jessie, who runs the titular saloon, we meet Lord Ernle, an English baron; the exotic courtesan San Saba, "the most beautiful whore on the plains"; Charlie Goodnight, the Texas Ranger turned cattle driver last seen in McMurtry's Comanche Moon, and Nellie Courtright, the witty and irrepressible heroine of Telegraph Days. McMurtry traces the rich and varied friendship of Wyatt Earp and Doc Holiday from the town of Long Grass to Buffalo Bill's Wild West Show in Denver, then to Mobetie, Texas, and finally to Tombstone, Arizona, culminating with the famed gunfight at the O.K. Corral, rendered here in McMurtry's stark and peerless prose. With the buffalo herds gone, the Comanche defeated, and vast swaths of the Great Plains being enclosed by cattle ranches, Wyatt and Doc live on, even as the storied West that forged their myths disappears. 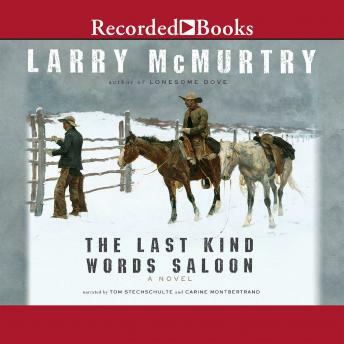 As harsh and beautiful, and as brutal and captivating as the open range it depicts, The Last Kind Words Saloon celebrates the genius of one of our most original American writers.